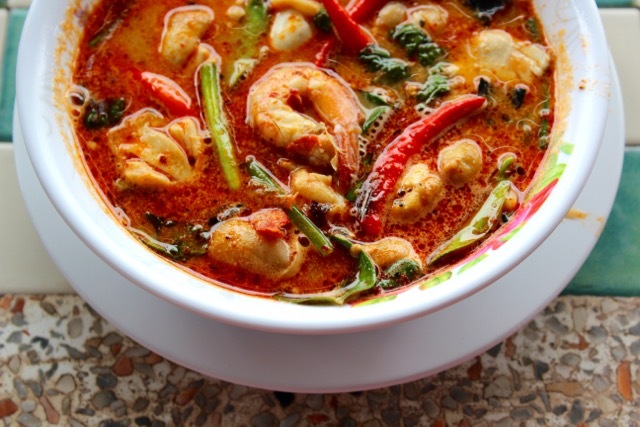 We had three generous bowls of this amazing tom yam goong alongside the three plates of pad thai and fried rice at a roadside eatery outside Bangkok. 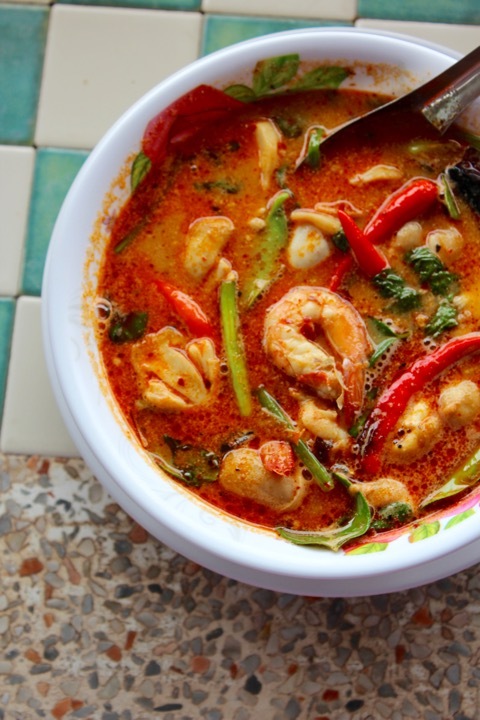 It’s hard to describe how darned good this soup was, but visually, you get clues that it isn’t your watery, dubious neighborhood restaurant equivalent of tom yam. Just look at it. As if we didn’t have enough food, I got some stir-fried chicken over rice as well. It was good, but just not AS good as the pad thai and tom yum goong. 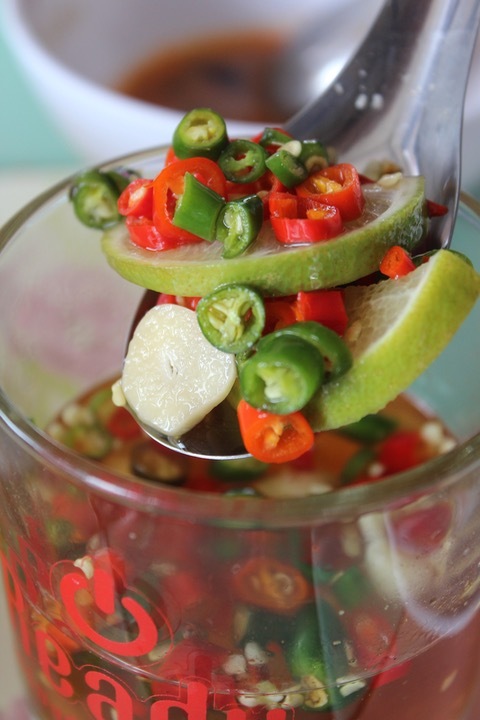 And in case your food wasn’t flavorful or spicy enough, how about a spoonful of this sawsawan or condiment made up of chopped chilies, garlic, lime juice and fish sauce? In terms of food highlights, this outside Bangkok road side late lunch was definitely one of the most memorable meals we have had for less than $3 each. Hi MM, were you a party of nine people including the driver? You ordered 3 servings of pad thai, 3 servings of fried rice, 3 servings of tom yum goong, and chicken rice (how many?). Some serious appetite! What did you have for dessert? I have increasingly realized that Thai food in the Philippines is like a watered down version of the real deal. Have always been happy with Peoples Palace in GB or Mango Tree in BGC more for the service rather than the food, but I bet in terms of honesty, and the ability to satisfy a hungry stomach, this open air restaurant experience of yours is a winner. 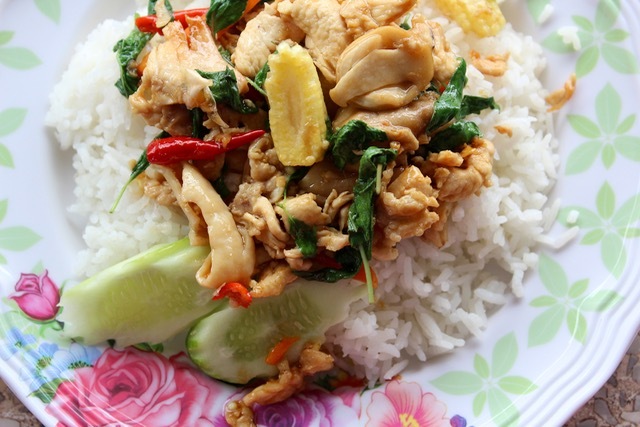 Thai food here in Houston is expensive, but not as much as Japanese. Some Pinoy entrepreneur ventured into Thai resto combo Pinoy. That boggles the mind! ! Mango and sticky rice — great! But do you know what is even better? Guimaras mangoes with budbud kabog! Tom Yummm Goong to me. Do you remember which roadside eatery this was at? I would love to try this (I’m Filipino, but I live in Thailand).